Michigan State baseball hosted its 14th-annual First Pitch Dinner Saturday night at the Kellogg Center, drawing a crowd of over 500. Jay Gooding was honored as the Alumnus of the Year, while former Major League Baseball manager Jim Leyland was the keynote speaker. EAST LANSING, Mich. — Michigan State baseball hosted its 14th-annual First Pitch Dinner Saturday night at the Kellogg Center, drawing a crowd of over 500. Jay Gooding was honored as the Alumnus of the Year, while former Major League Baseball manager Jim Leyland was the keynote speaker. The night began with an introduction of the 2019 Spartans by the master of ceremonies, Jim Cotter, then an invocation by junior pitcher Caleb Sleeman, before dinner. Following dinner, Boss addressed the crowd, introducing the former Spartan baseball alumni in attendance and then introduced Gooding and presented him with the Alumnus of the Year award. A native of Southfield, Michigan, Gooding is an MSU alum and was co-founder of Aqua Pharmaceuticals. He was instrumental in various Spartan Baseball projects including the infield heating project at McLane Stadium at Kobs Field, renovation of the team locker room, Dominican Republic trip and lights at McLane Stadium at Kobs Field. 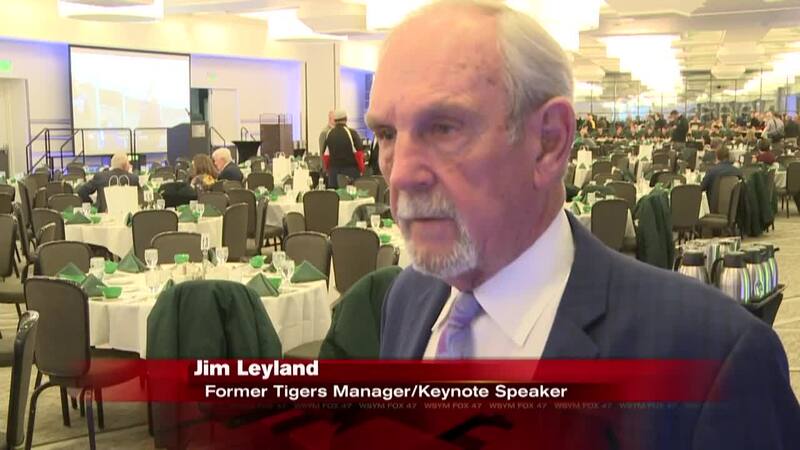 After Gooding’s speech, keynote speaker Leyland spoke, telling stories and jokes, along with meaningful advice to the players, about baseball on and off the field. This season’s Spartans open the 2018 ledger on Friday, Feb. 15 at 7:30 p.m. ET at New Orleans in a three-game series against the New Orleans Privateers in the first of a 56-game regular-season ledger. MSU and UNO play on Saturday, Feb. 16 at 2 p.m. ET, before the series finale of the opening-weekend series on Sunday, Feb. 17 at 1 p.m. ET.